A big question: how to reach people about Justin Trudeau, and disillusion them about him? There are several ethics charges against him. Great. I agree that the moral argument is the strongest one. As for his dipping into public funds for his private pleasures, I don't see a huge amount of fervor being ignited about this. Do I have any alternative to suggest? Yes. 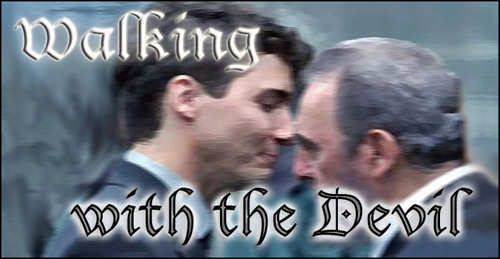 Justin Trudeau - Walking with the Devil. My answer: Justin Trudeau - Walking with the Devil. MUSIC. PLEASE LISTEN. Why music? Music reaches us in a way that "idea words" don't. Also, we don't have music on our side. In fact, we're blocked because the mainstream media wouldn't carry music that doesn't fit its anti-Conservative and anti-freedom agenda. PS. I'm sending to all Conservative federal MPs, have sent to subscribers, and posted to Facebook. Further suggestions about whom to send the piece are very welcome. It would be great to see Trudeau generally associated with Walking with the Devil. Charming, yes. Good, no.